What If Imran’s Pakistan had toured the Caribbean in 1983? One of the great imponderables from the golden era of the early 1980s is the likely outcome of a full Test series between Imran Khan’s Pakistanis and Clive Lloyd’s West Indies at the time, in early 1983, when the Pakistan captain was bowling at his sharpest and his leadership of the brilliant, exotic and occasionally eccentric team was proving inspirational. What was infuriating back then, and still is almost 30 years later, is the loss to cricket caused by the injury to Imran sustained at the apogee of his greatness. Having annihilated India in Pakistan 3-0 during the previous winter, at the same time that England were sweating down under, the cricket world was coming to terms with the fact that, for the first time since the advent of Kerry Packer’s World Series Cricket, the fastest bowler in the world was no longer a West Indian. Instead that honour belonged to the Pakistani captain, Imran Khan Niazi. How then, would a series set in 1982-83 between West Indies and Pakistan have turned out? The all-conquering world champions, masters in both forms of the game taking on the mercurial challengers, would surely have represented the most glamorous battle of the post-Packer era. Pakistan’s storming progress under Imran, defeating both Australia and India at home after being edged out overseas against England, suggested that their next and most logical challenge should be Lloyd’s team. However, the international itinerary meant that this was never to be. Conjecture about the likely result makes for an interesting debate, though, so let us cast our minds back to the spring of 1983 and examine the balance of power in Test match cricket as it related to our protagonists. Imran Khan had been appointed Pakistan’s captain ahead of the 1982 tour to England. In what had been a turbulent period in the country’s cricketing history – even by Pakistani standards – the Lahore all rounder had replaced Javed Miandad. A somewhat contentious choice to begin with, Javed took over the captaincy for the 1980-81 home series with the West Indies, a contest perhaps best remembered for Sylvester Clarke’s brick throwing prowess and Imran’s maiden Test century, achieved on his 28th birthday. Holding, through injury, and Roberts, through absence, took no part in the Test matches, while the pace quartet consisted of Marshall, Croft and Garner in addition to Clarke. Lloyd’s tourists took the series 1-0, the pace quartet consistently proving too hot for the Pakistani batsmen. The veterans Sadiq and Majid looked shaky throughout, victims perhaps of the continual surfeit of pace since World Series Cricket. Similarly, Zaheer appeared to be suffering from a form of shellshock, finishing the rubber with an average of 14.25. In its tour summary, Wisden noted of Pakistan Their biggest problem was finding a reliable opening pair, consistent middle-order batting and a good enough second seamer to assist Imran Khan. Maybe the man who would be king, Imran Khan, had made the same observations and had taken the same mental notes, unaware of his own future accession. Following series defeat in Australia at the end of 1981, where Lillee and Javed famously came to blows at Perth, all ten of Javed’s team mates from the final Test in Melbourne refused to play in the home series with Sri Lanka unless there was a change in the captaincy for the England tour. Three players withdrew their objection but Imran, Majid Khan, Zaheer Abbass and Mudassar Nazar only returned for the final Test in Lahore where Sri Lanka were crushed, the victims of Imran’s match bowling figures of 14-116. Prior to the final Test, Javed had indicated he would not wish to captain the team to England and, at the age of 29, Imran Khan became captain of Pakistan. In the 1982 series in England, the home side narrowly emerged as victors with Imran securing the man of the series award. His own bowling at Edgbaston and Headingley, his backs to the wall batting in both of those Tests, combined with Mohsin Khan’s 200 at Lord’s and the wiles of Abdul Qadir, meant that for the first time since perhaps the captaincy of Asif Iqbal in the mid and late 1970s, Pakistan were beginning to do justice to the talent within their squad. Perhaps the single, abiding image of the whole tour was that symbolic uprooting of Botham’s off stump, beaten by sheer pace, on the first day at Edgbaston. Although the series was marred by umpiring disputes – so strongly did Imran feel that his campaign for neutral umpiring began on this tour – a new team with a new spirit was beginning to solidify. A home series win against Australia in the autumn of 1982 was followed by the visit of India for a six test series. During the 1982 England series, Richie Benaud had remarked that Imran was the greatest player that Pakistan had ever produced and, having factored in Michael Holding’s knee injury, the world’s fastest bowler. The home series with India in 1982-83 placed the Pakistan captain among the rarified elite of the game, so commanding was his captaincy, so penetrative his bowling. Imran’s figures from that series are impressive enough in isolation; their contribution to the team effort in winning the series was simply huge. What was perhaps more impressive, and possibly even more difficult, was to galvanise a team of glorious but disparate talents into a fighting unit with a unified sense of purpose. Fractious from its inception, the Pakistani team had been a fusion of the great urban and political centres of Lahore and Karachi, administrative interference and incompetence allied to tribal infighting. Pakistan captains were often at the mercy of patrician selectors, occasionally from the military caste who would have a vision of the game and team selection which would be at odds with the man leading the side. Imran’s brilliance in 1982-83 was to corral this array of talent in the dressing room to perform despite traditional disadvantages and get them to play as a team and to play to win, not settle for the draw, a convention which he detested. Imran’s own contribution to that series with the ball was, of course, immense. His 40 wickets at 13.95 meant that he became the first Pakistani to pass the milestone of 200 wickets. He took more than twice the number of wickets of his nearest team mate, Sarfraz, who finished the series with 19 wickets despite having bowled 18 overs more than Imran overall. In addition, his century and 10 wicket haul in the 3rd Test at Faisalabad secured him the honour of joining his old adversary, Ian Botham, in becoming only the second player in the history of the game to achieve that feat. But, again, perhaps even more noteworthy in the broader context of a team game was his ability to take the strain and let others simply concentrate on their own performances. Mudassar scored 761 runs and topped the charts for the series, Zaheer weighed in with 650 and Javed, recently deposed, scored 594. The importance to Pakistan of the new captain’s smooth relations with Zaheer and Javed were paramount in unifying the team. Zaheer had long coveted the captaincy despite being singularly unsuited to the job. An elegant record breaker and destroyer of all but the quickest of bowling attacks, Zaheer was, Imran felt, simply too self-absorbed, defensive and conscious of his own performances to lead the side. Javed, on the other hand, was a player Imran greatly admired. Quite the opposite of his captain in upbringing, Javed was a Karachi street fighter, fiercely competitive and, most importantly for Imran, a team man. Imran was able to channel Javed’s occasional abrasiveness to good effect throughout his reign. Always a fighter and never a sulk, Javed pledged his allegiance to Imran despite the discomfort he may have felt at serving under a man who had recently deposed him as leader. Imran’s winning formula during 1982-83 succeeded in allowing Javed to bat aggressively with the team’s interests in mind, without having the burdens of leadership affect his own relations with his team mates. Zaheer, meanwhile, was allowed simply to bat and bat and bat, free from the distractions and compromises that captaincy would require of his own game. Additionally, Imran did not shy from the tough decisions that a captain is often expected to make. Possibly his most difficult was the dropping of his cousin, Majid Khan, during the Indian series. Two further characters, equally complex, were integral to Imran’s vision of a successful Pakistani team. 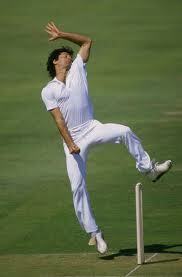 The first, Abdul Qadir, was a leg spinner whom Imran had insisted tour England in 1982. Beguiling and with endless variations, he was, on his day, a match winner. Without perhaps possessing the control of Warne or Muralitharan, he was an antidote to a game that was becoming focused on pace. Where spinners were included these were usually slow left armers or of the off-break variety. For new cricket followers in the early 1980s, Qadir was, in most cases, the first leg-spinner they would have seen. With his bouncing rhythmic run up, twirling fingers, goatee beard and whirling action in delivery stride, there was something intangibly eastern about Qadir’s cricketing persona. He was important to Imran in that he provided a surprise element. If cricket fans had not seen his like before, then this applied to batsmen too. At around the time that Bob Willis remarked that spinners did not win Test matches anymore, Qadir arrived to disprove the theory. Then 27 and following a stuttering test career that began in 1977-78, Qadir lacked the bounteous self-confidence of a Warne. With Imran’s backing and encouragement, Qadir realised he had a mentor as well as a captain, a leader who would cajole him when he needed it. The other exotic figure in Imran’s battle plan was a veteran reaching the end of his career. Sarfraz Nawaz was then 34 and bowling at a pace considerably reduced from his pomp in the mid and late 1970s. Ostensibly right arm fast-medium, Sarfraz had been Pakistan’s innovator in the arts of reverse swing. Moreover, he had acted as his new captain’s mentor on Imran’s maiden trip to England in 1971. With just a couple of years remaining in his test career, Sarfraz had a valuable role in passing on his knowledge to a younger breed of Pakistani seam bowlers like Tahir Naqquash, Shahid Mahboob, Rashid Khan, Jalal-ud-Din and Azeem Hafeez. A Punjabi speaker and holder of forthright political views, he was the Paul Breitner of Pakistani cricket, a figure who would later enter politics along with Imran himself. With each of these important team relations cemented and with potentially warring factions placated, Imran could look ahead to the challenges of the 1983 World Cup in England followed by a series in Australia the following winter. He was the fastest bowler in the world, greatest all rounder, glamorous celebrity figure and leader of a team who now played as a collective, their brilliant talents harnessed, for once, to a “Team Pakistan” ethic. Then, at the very height of his powers, the fastest bowler in the world was diagnosed as having a stress fracture in his left shin. It is difficult to underestimate the profound impact that this had on Pakistani cricket. So great was Imran’s influence on his side, through his own performances and as a result of his talismanic effect on team mates, that he travelled to England and the World Cup to perform as batsmen alone. Facing a potentially two year sabbatical while his shin healed, Imran’s value was so great that he would continue as captain and mentor to his developing team. The side containing Zaheer, Javed, Sarfraz, Qadir and the talents of Mohsin Khan, Muddassar Nazar, Mansoor Akhtar, Salim Malik and Tahir Naqquash would never find out just how great they could have become as a group at that point without that added vital ingredient of Imran’s superlative bowling. Let us, however, engage in a little counterfactual history and consider what might have happened had the shin not fractured and Imran’s merry band, and not the Indians, toured the home of the reigning superpower of cricket, the West Indies, in the spring of 1983. A tour of the West Indies in that era often brought with it demands for a specific brand of cricketer. Just as Imran insisted on Qadir’s inclusion for the England tour in 1982, so, we can assume, he would have fought for the selection of players to join him in the Caribbean that met the demands created by these most exacting of opponents. Wasim Raja was the kind of grizzled, combative yet selfless hardman the captain admired. A thorough team man, Wasim’s record against the West Indies in 1976-77 and 1980-81, where he topped the batting averages on each occasion, meant that he was the type of character that Imran would likely go out on a limb for, his selection merited irrespective of domestic form. Wasim’s 517 runs at 57.44 in the Caribbean in 1976-77 and 246 at 61.50 in a low scoring four Test series in 1980-81 demonstrated a talent, unique among his contemporaries, for tackling the West Indian speed men. The slow left armer, Iqbal Qasim, who had taken 17 wickets at 17.94 in the same 1980-81 series, was another whose talents may well have demanded a berth on the plane to the Caribbean. Arriving in the West Indies in mid-February 1983, the Pakistanis would have encountered a West Indies coming to terms with the defection of a team of “rebels” to South Africa. Although these players were subsequently ostracised, their elopement only affected the regular West Indies team in one significant aspect: that of the banishment of Colin Croft. Of all the “rebels” he was the only one who could safely be said to have been a regular in the test match side. In any event the promotion of Malcolm Marshall to the pace quartet can hardly be said to have weakened the team. Moreover, Croft, then 30, was increasingly injury prone and it is not clear how much longer his international career would have lasted had he not toured South Africa. Therefore, the team that went into the series against India that spring – and would have faced our Pakistani tourists – contained the pace quartet of Holding, Roberts, Garner and Marshall. In reserve, in case of injury to the first choice pace men stood Wayne Daniel and Winston Davies. Opening the batting was the old firm of Greenidge and Haynes. The foil to the incomparable Richards and Lloyd was the phlegmatic left-hander, Larry Gomes, while sixth batting spot went to Gus Logie. The team probably benefited from the South African defection of David Murray in that the dapper Jeffrey Dujon moved up to claim the stumper’s spot while also batting at number seven. Although Lloyd would retire at the end of the 1984-85 Australia tour and Andy Roberts would call it a day at the end of 1983-1984 in India, the West Indies were establishing a pattern of personnel that would see them through their greatest and most destructive years, from 1983 to 1986, and the devastation of England. In February 1983 and the beginning of this series, however, they had not played international cricket together since returning from Australia at the end of 1981-82. In 1982, by some quirk of the international calendar, there was no international cricket in the Caribbean. Therefore, this was a team in the process of reacquainting themselves with each other, with a slightly reconfigured line-up under the watchful eye of its old mentor, Clive Lloyd. The great, destructive streak which would take test cricket to unparalleled heights between 1983-84 and 1985-86 with the record of 21 wins, 8 draws and only 1 defeat in 30 test matches had yet to begin, but Lloyd’s assembled class of ’83 would provide the nucleus of the team for that era. In short, the blueprint for continued world dominance started here. The team that did actually tour the West Indies in early 1983, India, were beaten 2-0 in a five Test series. The new regular member of the pace quartet, Malcolm Marshall, was only bested in the bowling averages by the veteran Roberts, while both Garner and Holding moved through the gears after a year’s absence from international cricket. In Guyana, in a match ruined by rain, India escaped to draw with Gavaskar compiling an unbeaten 147. In Antigua, each side scored heavily on a placid pitch. In Jamaica, on a quicker surface, West Indies won having routed the Indian batsmen twice in a game affected by stoppages for light and rain, Holding having removed Gavaskar’s leg stump with the first ball of the Indian second innings. In Barbados, as was the case two years previously against England, the tourists were again routed, bowled out cheaply in each innings on the Caribbean’s fastest pitch. So, at this crucial juncture in the history of cricket in the post-Packer era, how might a fresh Imran and his reinvigorated team, free from mutinous distractions, have played out the 1983 series? By one of those vagaries of the fixtures calendar, Pakistan did not play the West Indies in a Test series between 1980-81 and 1986-87. Although the team did meet in several limited overs tournaments, most notably the World Series Cup in Australia in 1981-82 and 1983-84 and the Sharjah tournament in 1985-86, there was not a single five day game played between them during this time. In 1986-87, a three Test series was drawn 1-1 in Pakistan and in 1988, in the West Indies, the home side came from behind to square another three match series. In each series Imran had proved a lynchpin, despite not bowling at his pre-stress fracture quickest. In Pakistan in 1986-87, he took 18 wickets at 11.05, while also revelling in the Caribbean conditions in spring 1988 with 23 wickets at a cost of 18.08. Clearly, the Lion of Lahore still roared loudly enough, even at a reduced fast-medium. In each series, Pakistan’s batting relied on Javed, Zaheer having since gone into retirement. However, Javed was assisted by a new generation of combative Pakistani batsmen. Rameez Raja, Shoaib Mohammad, Saleem Yousuf and Salim Malik all played bravely in 1988 to achieve a richly merited draw with the West Indies. This West Indies was not the 1983 vintage, however. In 1986-87, only Marshall remained of the side that played throughout the period 1982-83 to 1985-86, while in 1988 Ambrose, Patterson and Winston Benjamin had joined the Bajan. Wasim Akram, tutored by both Imran and Sarfraz, had joined the ranks of the Pakistani team in 1984-85, tilting the bowling balance between the two teams to something approaching parity. In short, the West Indies teams that Pakistan took on in 1986-87 and in 1988, although strong, were not on the same plane as those prior to 1986. A low scoring series in 1986-87 and a close fought, pulsating encounter in the Caribbean eighteen months later suggested two teams on virtually the same level, with West Indies nudging ahead in terms of the experience of their batting strength. This can be said to be quite the reverse of the situation in 1983 where West Indies would be ahead thanks to their formidable bowling unit. A 1983 series between the two teams would have seen Holding, Garner, Roberts and Marshall go head to head with Pakistan’s Imran, Sarfraz, Tahir Naqqash, Qadir and the “Golden Arm” of Mudassar Nazar, if we take the team that played in the final Test against India in February 1983 as the one forming the bowling attack. Given that an important element in the Pakistani batting line up, Zaheer, had never particularly excelled against extreme pace – he had famously been hit on the head by Sylvester Clarke in 1980-81 – a great onus would have been placed on the tenacity of Javed as well as Imran, Mohsin Khan and the obdurate Mudassar Nazar. On the speed merchant’s paradise that was Barbados at that time, Imran can be expected to have proved dangerous, as would his opposite numbers in the West Indian line up. At Jamaica, too, pace might be expected to prevail, with Imran leaping into his famous delivery stride to keep his side in the game. On pitches that allow for a modicum of turn such as Port-of-Spain, Qadir might have had a significant impact, perhaps one that could compete with his 6-16 at Faisalabad in 1986-87 against the same opposition who on that occasion crumbled to 53 all out. After all, the same West Indian batting line up had demonstrably failed against the unheralded leg-spinner Bob Holland at Sydney in 1984-85, where West Indies were made to follow on. If we take a more positive view still of the likely match up in 1983, it is clear that Imran’s team was on a steep upward curve beginning with the England series in 1982, followed by further improvement in 1982-83 against Australia and then the destruction of India later that year. Performing with an unusual synergy of pace, control and swing in the Indian series, Imran would surely have found the Caribbean wickets even more receptive to his skills. Furthermore, the delivery which Richie Benaud referred to in 1982 as the “indipper” which clean bowled Chris Tavare in the one day match at Trent Bridge, and which also shattered the stumps of Gavaskar, Viswanath and Sandeep Patil at Karachi the following winter was a classic example of what we now know as reverse swing. At his absolute peak of speed and fitness in 1983, it is mouthwatering to imagine Imran bending the ball in sharply from off-stump to the West Indies batsmen at speeds in excess of 90 miles per hour. The expression on the face of the departing Jeff Dujon at Lahore in 1986-87, after a huge late Imran inswinger uprooted his middle stump might just have been repeated all over the Caribbean in 1983. The Pakistan of this vintage was not, however, a one man team. Imran’s leadership meant that he acted as facilitator, enabling his charges to express themselves as individuals with the ultimate goal being the good of the team. Imagine then, a Mudassar, fresh from his Indian triumph booking in for “bed and breakfast” as Kenny Barrington would say and allowing himself, Boycott like, to become the foundation stone of the innings. Mudassar’s opening partner, Mohsin Khan, wristy and glamorous, the future Bollywood star, dashing from the start of the innings, might just have been the ideal foil for his more sedate partner at the other end. Imagine too, a relaxed, confident Zaheer. “Zed”, the Gloucestershire man, pumped full of runs from the Indian series and oozing class might just have found the tracks of Bourda, St. Johns and Port-of-Spain to his liking. The fulcrum of the batting, of course, would have been Javed Miandad. The Robert Kennedy to Imran’s JFK, Javed would not have been afraid to bear the burdens, take the blows and carry the attack to the “four horsemen of the apocalypse”. Fiercely intelligent as a batsmen as well as brave, Javed could bat against type and drop anchor if necessary. His series of innings in the Caribbean in 1988 and his measured performances, under great pressure, in the 1992 World Cup semi-final and final were all supreme examples of his doggedness as well as his skill. The arguments could be endless, but it is irrefutable that this was a unique point in modern cricketing history with the game’s ruling power, the West Indies, facing a challenge from a gifted, unified team led by an irresistible leader. At the exact point where the West Indies would propel themselves to even greater deeds in their peak years leading up to 1985-86, they would have faced a calibre of challenge not seen since the Packer years. What would have been at stake in the Caribbean in 1983 was ultimately perhaps the realignment, maybe only temporary, of the international cricket landscape. Indeed, only Greg Chappell’s Australia of the immediate post-Packer era could be said to have rivalled the Pakistan of this time and Chappell’s Australia was then past its peak. Capable of bowling long spells at high speed, Imran’s fitness throughout the series would have remained crucial to any hopes the Pakistan team might have had. He would have relied on the guile and experience of Sarfraz and the complexities of Qadir to help bamboozle the West Indies batsmen. As always mate a great article that had me absorbed from the beginning to the end. Kudos. As for the subject of the article, my admittedly biased opinion is that had Imran been healthy, he would’ve edged such a fictional series Pakistan’s way. He was truly at his peak when he got injured. We can only imagine what greater heights he could’ve achieved if not for that pesky shin. WI would likely have edged out Imran’s side 2-1 or the like. Simply because Imran with a stronger team in 88 faced a weaker WI team and could only manage a draw (though should have been 2-0 in favor of Pakistan had the umpires been less patriotic towards the end). Great article. Imran, Viv and Macko were, for me, the best of the best of that amazing era. Would have been great to have seen them all at their peak in the same series. I rate imran the fast bowler right up there with the Lillees and Holdings. … Your treatment of the might-have-beens made my day. However, even after losing a yard or two he still was fast till 88. The fast-medium label is reserved for Imran of the post 88 period in my very humble opinion.